Simple popcorn snack mix recipe using just six ingredients. 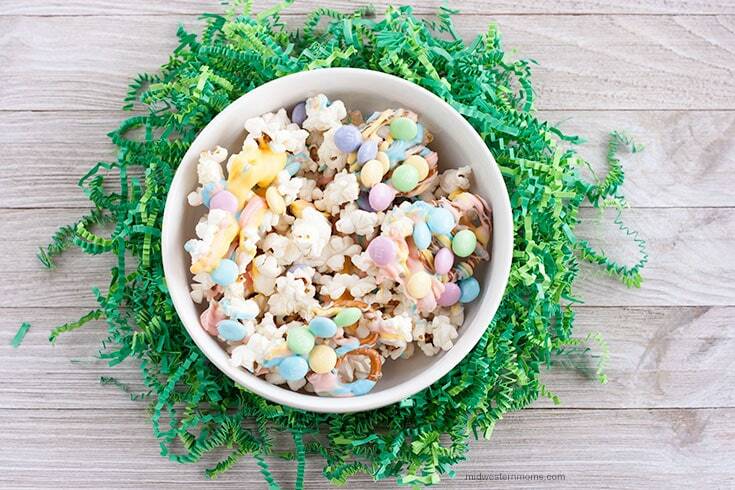 This Easter Popcorn Snack Mix is a perfect blend of sweet and salty! 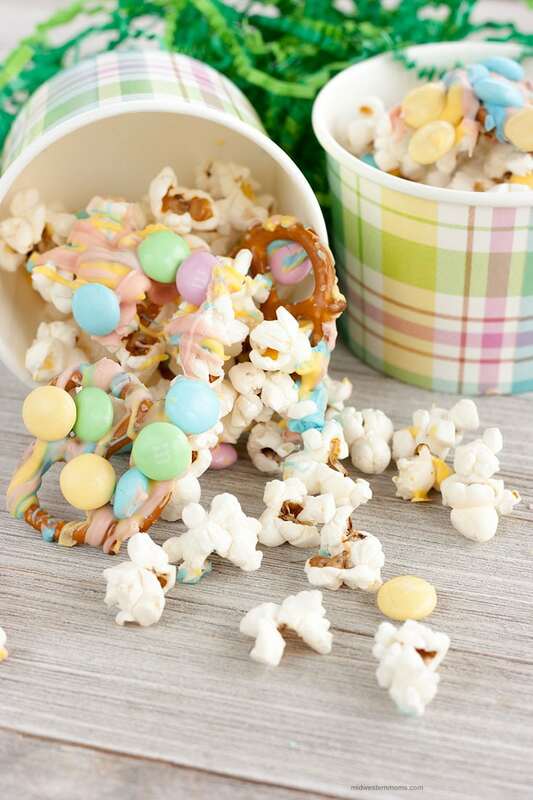 This popcorn snack mix is a great recipe if the children want to help you make it. Parents, you will want to be the ones to melt the candy melts. Depending on the children’s age, you may want to hand the drizzling part. Don’t worry if you have young kids, they add the candies or the pretzels to the mix. After gathering up all your supplies, it is time to get started! I have made a quick video to show you how I made the snack mix. There is a printable recipe at the bottom of the post with directions and measurements. Deliciously sweet and salty at the same time! YUM! 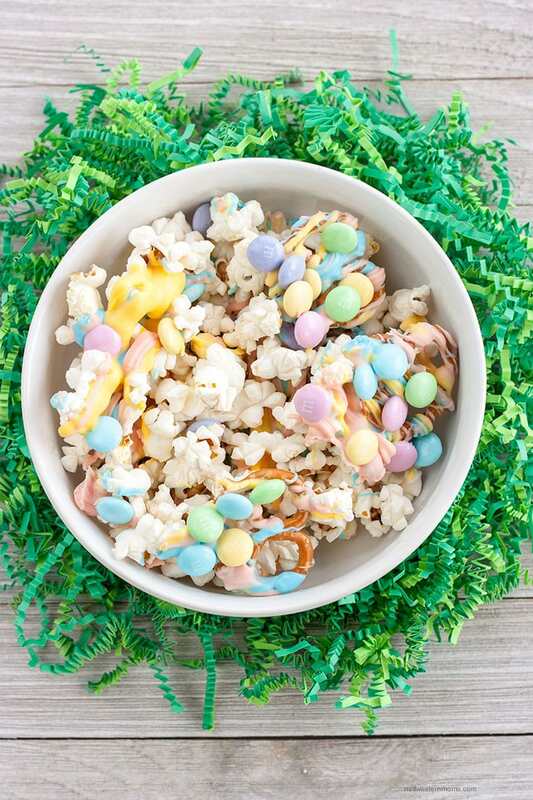 A Sweet and Salty snack perfect for Easter! Lay your popped popcorn on a cookie sheet lined with parchment paper. Layer your pretzels on top of the popcorn. Melt the blue candy melts according to the instructions. Drizzle the melted blue candy melts over the popcorn mix. Melt the yellow candy melts according to the instructions. Drizzle the melted yellow candy melts over the popcorn mix. Melt the pink candy melts according to the instructions. Drizzle the melted pink candy melts over the popcorn mix. 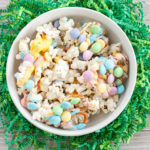 Sprinkle the Easter M&Ms over the top of the popcorn mix before the candy melts harden. Lets the candy melts harden before serving.